Proceedings of the Twenty-Third Vertebrate Pest Conference, (VPC-2008). Published at the University of California, Davis, Published November, 2008 334 pp. ISSN: 0507-6773. 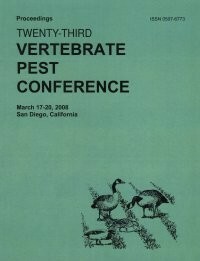 Proceedings of the 23rd Vertebrate Pest Conference, March 17-20, 2008. San Diego, CA, arranged by the Vertebrate Pest Conference. Editors Robert M. Timm and Minoo B. Madon. Description: Includes papers on these and many more topics: Progress in Sensory Biology..., Rodents, Rodent Control, and Food Safety, Managing Gulls to Reduce Decal Coliform Bacteria in a Municipal Drinking Water Source, Rodenticide Misconceptions, Successful Use of Alarm and Alert Calls to Reduce Emerging Crop Damage by Resident Canada Geese..., Tetracycline as an Ingestible Biological Marker for Feral Pigs. Also available on CD-Rom.